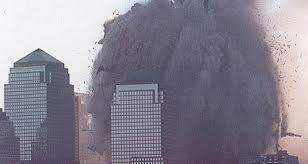 So the start of the collapse of WTC 2 was buckling? but all 4 exterior walls of the structurally sound bottom section started blowing out anyway and they weight of the top section was no longer a factor accept for 1 side of the building. Is it the vertical columns blowing out? Or material being pushed out the windows and holes? The below video shows WTC 2 was tiling before the top of the tower gave way into the building below. The top tilts, then falls as a unit into WTC 2. The top holding the angle? The tilting stops as the pivot point gives, but the downward motion of the upper part of the tower does not. WTC2 'Collapse' - Tim M.
The outer walls are facade connected to the outer columns? I see the force from the top dropping pushing dust and rubble out? And maybe the pieces of facade? But I don’t see the vertical columns being blown out? What would cause the outer columns to blow out? Are you saying demolitions made the walls blow out? Then you should be able to see the shockwaves and hear the detentions? See below for examples of shockwaves from explosions. Another video showing shockwaves, building implosion. The other two things I got from the video was the sound of detonations compared to the building’s collapse. And the amount of echoes? Then the lady said she could feel the vibrations from the detonations? I dont deal with super-imposed videos, sorry. Your actually quite foolish for posting that. It indicates you have a tendancy to show fake videos to prove your point. You should not have posted that..
What I saw and I am sure anyone capable hearing heard on the ground was a 110 story building being reduced to a small pile of rubble and cloud of dust in about 12 seconds.